If you are thinking of sailing to Antarctica, there is no way to avoid that body of water with the pirate name. 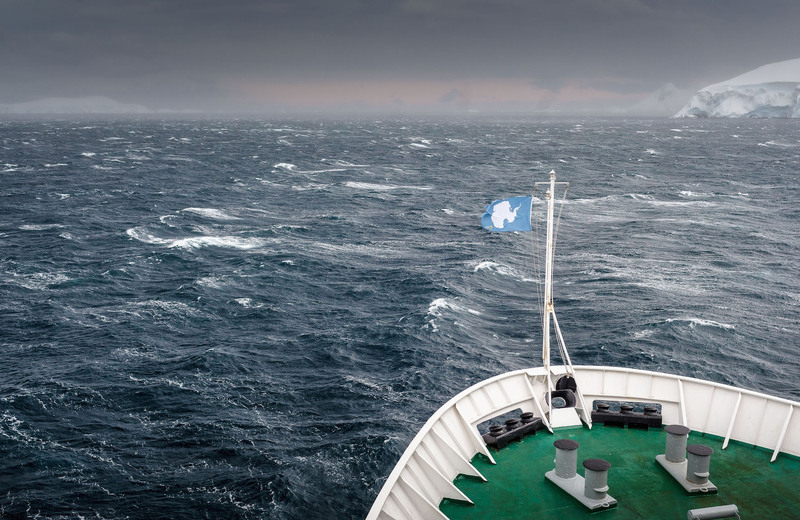 The Drake Passage, separating South America and the Antarctic Peninsula, is one of the roughest seas on Earth. Working as an expedition guide with vessels going to Antarctica, I have completed more than fifty voyages down south – this accounts for more than one hundred crossings of the Drake Passage. Not all of those times did we encounter a ferocious storm, though. If you are lucky enough, you may be crossing the Drake having a tea or a margarita on deck, watching the wake left by the ship, enjoying the noiseless albatrosses gliding overhead. But it is also true that the Drake can show you his worst face. Waves of several metres will pitch and roll the ship (the latter being much worse). Stewardesses will be sticking ‘vomibags’ on the rails (which will disappear quickly). You will hear things falling and breaking, and the unbearable noise of the drawer of your night table opening and closing while you are lying in bed, half dead, asking for forgiveness for all the things you’ve done wrong. It may sound a bit dramatic, but that last paragraph is quite close to reality. Still, not everyone suffers seasickness to the same extent. And there are those that don’t suffer at all. The crossing typically takes a day and a half, depending on the vessel’s speed and the weather conditions. Normally you will leave Ushuaia at about 18:00, and spend a full day and a half at sea before arriving in Antarctica to do a possible landing in the afternoon. Crossing the Drake Passage is an important part of the journey to Antarctica, and you should take full advantage of it. It is a great spot to enjoy bird watching (there are ornithologists and marine biologists on board who will be keen to assist you.) Some of the species you will be able to spot are Cape petrels, southern giant petrels and, of course, the wandering albatross – the bird with the largest wingspan on the planet. The Drake is also where you have time to listen to lectures on biology, history, geology, photography and much more. And on the way back from Antarctica (I know, sad!) the infamous sea will be the necessary space to reflect on the meaning of all that you encountered during your voyage. And believe me, it will be a lot. Try not to stuff yourself during the first dinner on board. As tempting as it may be, choose to have a light meal. Take the drugs. If you are prone to seasickness, take medication before departing (when you start feeling seasick it will already be too late). You can get the classic Dramamine, a Transderm Scop patch, or Phenergan. Phenergan seems to work better without making you as drowsy. A natural way to prevent seasickness is ginger. All the ships have a doctor on board, and they are always happy to help you with valuable advice. The Drake Passage attracts lots of seabirds, including the mighty wandering albatross, due to its proximity to the polar front. So bundle up and get on deck to enjoy some fresh air. Did the seasickness win the battle? Go to your cabin, lay down, and wait until the worst has passed. Antarctica and its calm seas are getting closer and the best is yet to come!